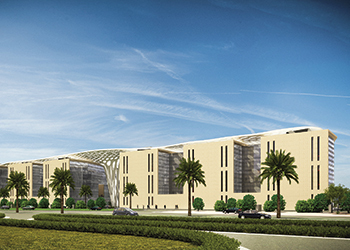 An artist’s impression of the specialist clinical centre in Qatar. SSH, a leading design, construction supervision and project management firm in the Middle East, has won a major engineering consultancy services contract for a road project in Bahrain in partnership with Hyder Consulting. The project, awarded by Bahrain’s Ministry of Works Municipalities and Urban Planning, is for the design of road and bridges as part of the widening and upgrading of the Sheikh Jaber Al Ahmed Al Sabah (SJAS) Highway in the kingdom. The SJAS forms part of the strategic North-South link, connecting Manama, Sitra Industrial Area, Alba and the Southern Governorate. It also comes as a section of the Future International Transportation Corridor with the proposed Bahrain-Qatar Causeway, said the company. The project is aimed at reducing traffic congestion and delays during peak hours by upgrading the current highway to a motorway standard. According to SSH, the design services will be implemented in three phases. In the first phase, a comprehensive traffic and transportation study will be conducted for widening and upgrading the highway to an uninterrupted motorway. The second phase involves preliminary and detailed design for the four-lane dual carriageway, pedestrian and vehicular bridges, grade separators, tunnels and underpasses, service roads, and slip lanes, while the third phase is for construction, implementation and supervision services, stated the company. SJAS is aimed at handling both the increase in car ownership and the rapid growth in Bahrain’s population from 1.4 million to an, estimated 2.4 million residents by 2030. The project is being supported by Kuwait Fund for Arab Economic Development as part of GCC Marshall Fund to Bahrain. Meanwhile, SSH has launched its Qatar office in capital Doha where it revealed designs of its recently awarded projects including the Specialist Clinical Centre for Dental, Dermatology and Diabetes Services in Hamad Medical City, and Wakrah Mall. Under a multi-disciplinary design and supervision services contract awarded by Qatar’s Public Works Authority, Ashghal, SSH will lead the development of the design of the specialist clinical centre on behalf of Hamad Medical Corporation. The project will have six interconnected buildings consisting of a shared three-level basement and ground floor plus four upper levels totalling 61,000 sq m, with the aim to provide a perfect platform for the development of a new “super-clinic” care facility. The project will deliver specialty outpatient and ancillary services, as well as education and research facilities. The result will be a state-of-the-art, patient-focused ambulatory campus. Meanwhile, E’emar Development & Real Estate Investment’s Wakrah Mall – located on the main Wakrah Road – will include retail shopping, a hypermarket, restaurants and sports and recreational activities. SSH’s scope of services includes multidisciplinary design services for the mall involving a built-up area of approximately 50,000 sq m.
COO and Qatar resident director Matthew Squires said: “We successfully gained our A-grade MMUP licence while in parallel executed a focused marketing plan resulting in the award of these two prestigious projects within a short space of time after entering in market.